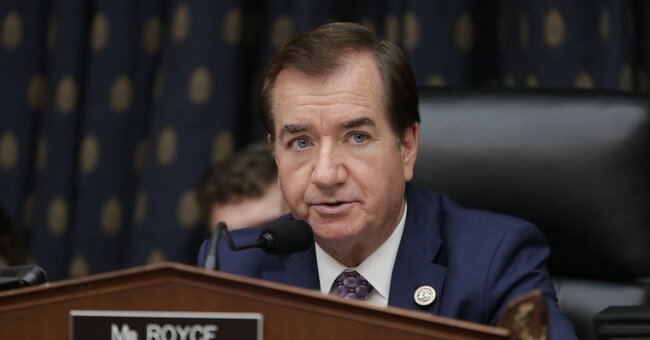 The list of House Republicans choosing not to seek re-election in 2018 is lengthy and now Chairman of the House Foreign Affairs Committee Ed Royce can be added to make it longer. The Congressman released a lengthy statement Monday evening explaining his decision to step away from Washington. “In this final year of my Foreign Affairs Committee chairmanship, I want to focus fully on the urgent threats facing our nation, including: the brutal, corrupt and dangerous regimes in Pyongyang and Tehran, Vladimir Putin’s continued efforts to weaponize information to fracture western democracies, and growing terrorist threats in Africa and Central Asia. With this in mind, and with the support of my wife Marie, I have decided not to seek reelection in November," Royce said. “I want to extend my deepest appreciation to the people of the 39th District for entrusting me with the responsibility to represent them. Our district is blessed to be diverse, and I’ve been successful in part because of my great staff and the relationships we’ve built with families, businesses and leaders in each of our communities. We’ve personally helped countless Southern Californians." “Orange County will always be home to Marie and me, and we look forward to being with all our friends at Lunar New Years, Korean American Days, Fourth of Julys and many other community events for years to come,” he continued. Sixteen Republicans and seven Democrats have announced their resignations ahead of the midterms. Some are leaving after accusations of sexual misconduct (Blake Farenthold, for example), while others are in tough districts that Democrat Hillary Clinton won in the most recent presidential election.